During the 1960s and 70s Oregon experienced strong employment growth (regularly in the 4-6 percent range), however the state also had very strong population growth (see first graph) and an increase in the labor force participation rate due to the aging of the Baby Boomers into their prime working years but also due to increased inclusion of women in the work force. In the 1980s Oregon saw decent population growth and solid increases in the labor force participation, resulting in employment growth of nearly 4 percent. In the 1990s, Oregon had strong population growth but no labor force participation increases, with employment grow averaging about 3 percent. In the 2000s, Oregon had mediocre population growth (still stronger than the nation’s), a declining labor force participation rate and employment growth averaged nearly 2.5 percent. Please see the previous post for a more complete discussion. This second graph shows annual employment growth since 1947, however in a different layout. This was used way back in the December 2010 forecast but hasn’t been seen since. It provides a nice visualization of how employment growth in recent years – pardon the pun – stacks up from a historical perspective. The 1980s were half good and half bad, while the 1990s were nearly all good. The relative slowdown of the 2000s discussed above is clearly seen in this graph as no year saw growth greater than 3%, although 2005 and 2006 were just a hair under. In fact, the state hasn’t seen employment growth above 3% since 1997 and according to our forecast, the state won’t see one in the coming decade either. Finally, this last graph illustrates something we discussed in our latest forecast publication and also borrows a page out of UO Professor Tim Duy’s playbook. 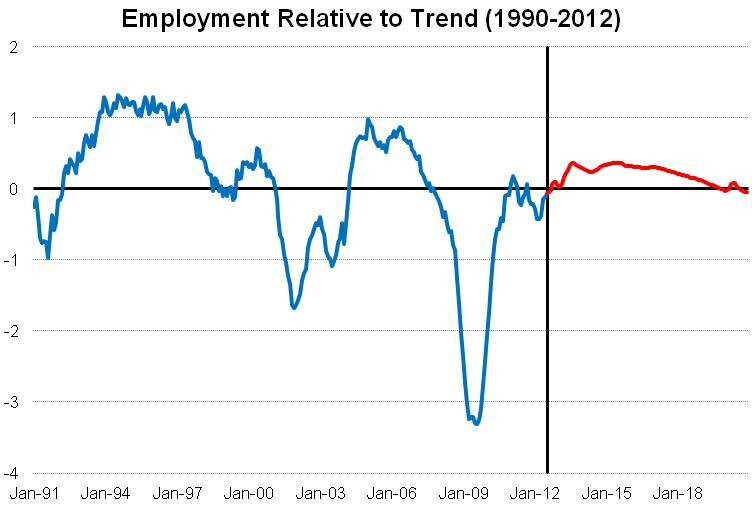 The graph shows employment growth relative to the past couple decades’ trend. Like Professor Duy’s Oregon Measure of Economic Activity, the growth is normalized to the two decade trend growth rate, which includes both expansions and recessions. 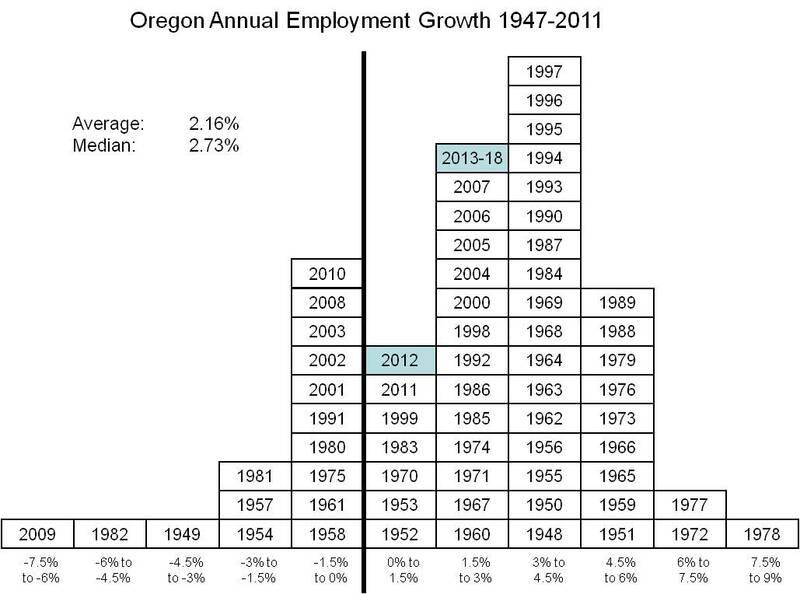 For Oregon that rate is 1.2% per year or just over 1,600 jobs per month today. 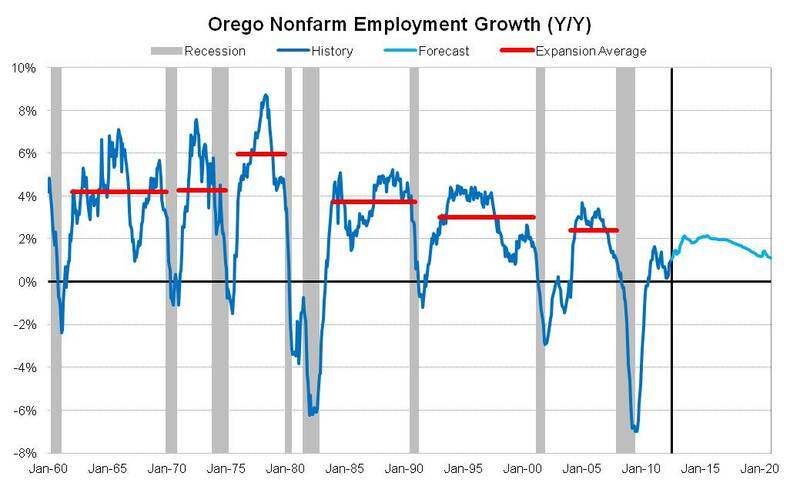 Current levels of job gains in Oregon have essentially matched this trend – that is the economy is growing at its average pace, however this rate of growth is significantly under the rate of the typical expansion (as can also be seen in that first graph above). Expected revisions to recent data will push this figure somewhat higher, however, more or less, back to trend instead of being slightly under it. Unfortunately this rate of growth is only strong enough to bring the unemployment rate down very slowly.